But don’t know who you should turn to in order to have problems with it fixed. If you want to know more about some of the common problems with ramps and how they can be fixed, then keep reading this article. This article talks about everything you need to know regarding ramp repair. If you are ready to get in touch with a contractor in order to start work right away then give us a call at 301-261-4933 or contact us here and someone will get back to you as soon as possible. On most properties, ramps are made of concrete and, as a result, will often need regular concrete maintenance to keep them safe. While concrete is an extremely durable material, there are a number of outside factors that can damage it. 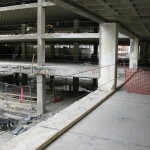 Overloading – Common in places like parking garages, too much weight can lead to buckling and cracking in the surface. Not only is this inherently a trouble in and of itself, but this type of damage can be made worse by other factors that pose a threat to concrete’s structural integrity. Chloride – Commonly found in deicing salts, this chemical agent can corrode concrete over time. With these damaging factors in mind, it’s easy to see how abused and neglected concrete ramps can cause trouble for the people who frequently travel them, especially for those with disabilities. Concrete restoration is a price commonly associated with owning a property that has concrete ramps, but many times property owners are unsure whether or not they should consider ramp repair in Virginia. If you don’t know whether you should have your ramp fixed, then consider getting an inspection. An experienced concrete contractor can look at your ramp and find imperfections that could easily threaten the structural integrity. As a property owner, there may be underlying issues that you could easily miss because you lack the proper training to identify them. By catching these issues early, you can remedy them before they become large issues. After having your property inspected, the contractor can help you decide your next course of action. In some cases, the ramp might be too far gone for repair and a complete ramp replacement is needed instead. In other instances, the damage might be relatively small and would require a solution as routine as a simple epoxy injection in order to fix the problem. Who Can Take Care of Ramp Repair? Any contractor that you consider hiring for any type of job involving concrete restoration should represent a company that is experienced in that area as well as number of other concrete services. Concrete repair is a very involved process and requires a certain level of training and experience to make sure that the job is done correctly the first time. Versatility is an important trait to look for because the contractor may notice and be able to handle other problems that appear during the ramp repair Virginia job. If you’re currently searching for a company that meets these criteria for your concrete replacement needs, then consider contacting Concrete Restoration Services. Having been in the industry since 1981, we not only specialize in ramp repair but other related areas such as concrete preservation, protection and leveling as well. We understand what it takes to meet your expectations and, with our competitive pricing and the quality of work guaranteed by our skilled and experienced contractors, we will do just that. If you live in the MD/DC/VA area then you can call us at 301-261-4933 and speak with a customer service representative. They will help you address all of your ramp repair and concrete restoration needs. Concrete Restoration Services provides FREE estimates on all of the above services!